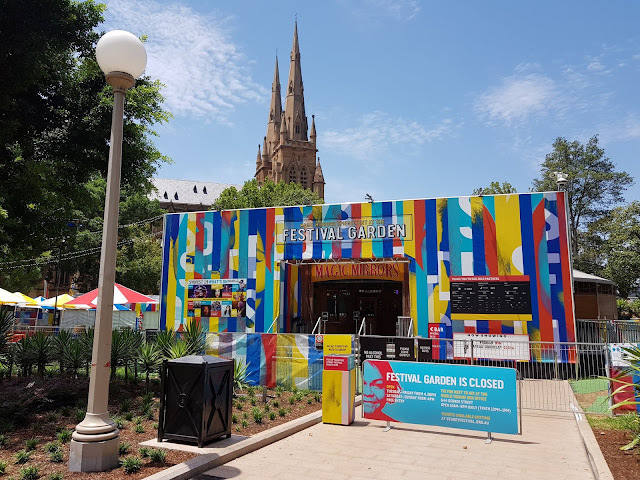 The colourful entrance to the Festival Garden in Hyde Park for the Sydney Festival, an annual arts festival which has been held in January since 1977. The Magic Mirrors Spiegeltent can be seen just inside the entrance, with the spires of St Mary's Cathedral rising above in the background. Linked to: Signs, Signs, Fences Around The World, InSPIREd Sunday. Wonderful weather for a great festival. This is as bright as your sunshine. St. Mary's draws my eye! I enlarged the photo to find the building is eye-catching, indeed, with its many colors and an interesting contrast to the resplendent architecture of the steeple in the background. The cathedral is wonderful. If you type it into the search box at the top, you'll see quite a few of my photos of it. I had to come and check this out from the colourful thumbnail.